Thanks to passionate UC Master Gardener volunteers, partners and friends, we raised $10,050 during #GivingTuesday! Social media was buzzing with activity and "UNselfies" celebrating the program for #GivingTuesday! #GivingTuesday provided an opportunity to raise awareness and talk about the UC Master Gardener Program and the incredible volunteers that make a difference across California's landscape. Funds raised will be used for both local county initiatives, school, community, demonstrations gardens, and statewide funds raised will be used to support advanced training opportunities to volunteers across the state in 2018. Reduce pesticide use and inspired habitats for pollinators and other beneficial insects. Social media was buzzing with activity on #GivingTuesday, with volunteers and program supporters sharing reasons why they love the program. 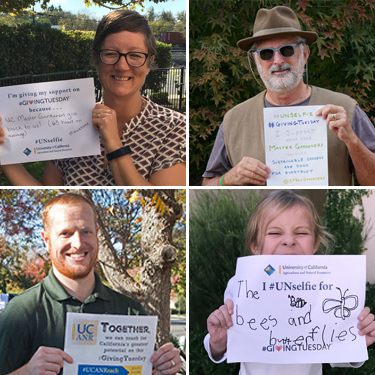 "UNselfies" or unselfish selfies were posted in support of the incredible impacts the UC Master Gardener Program makes across California. Check out the fun slideshow of #UNSelfies that were shared across social media on #GivingTuesday!